After the IFOY is before the IFOY—Who has the most innovative forklift trucks of 2017? 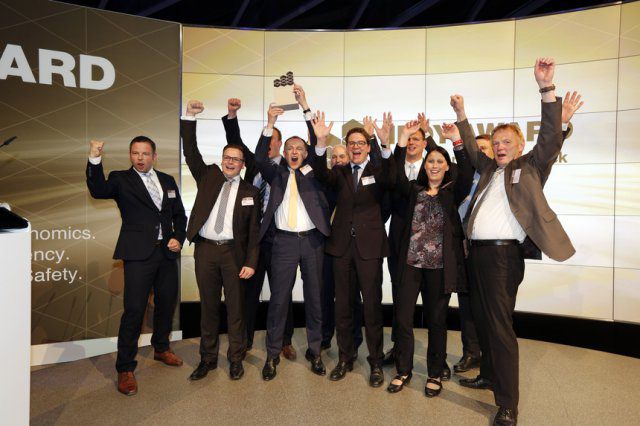 At yesterday’s gala on the occasion of the IFOY Awards in Hanover, the IFOY organization announced that Messe München will partner the IFOY Awards with its transport logistic, bauma and IFAT trade fairs starting in 2017. From the outset, all three trade fairs have been a platform for showcasing forklift trucks and warehouse technology equipment. That is why the next IFOY test days from March 2 to 9, 2017 will be held at the Messe München site. Specialists and journalists from around the world will be meeting there to put the vehicles through their paces. The awards will then be presented at transport logistic on May 9, 2017 in Munich. In future they will then alternate between Munich, at transport logistic, and in Hanover, at CeMAT. Also, as part of a special show, the nominated forklift trucks, warehouse technology equipment and intralogistics solutions will be presented at the next transport logistic—International Exhibition for Logistics, Mobility, IT and Supply Chain Management, which will be held from May 9 to 12, 2017 at the Messe München site. This marks a strengthening of transport logistic’s intralogistics exhibition area and offers interested visitors the opportunity to make up their own minds about the advantages and benefits of the world’s best equipment.